Laphroaig is about as classic Islay as you can get. 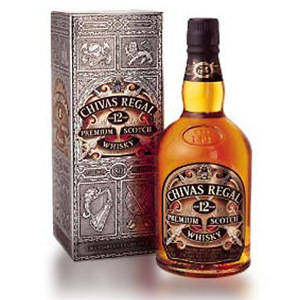 Very heavily peated, light bodied, a powerhouse of maritime flavors and smoke, smoke, and more smoke. Sometimes after a glass of Laphroaig, my mouth tastes like I’ve just finished smoking a pair of cigars. It really sticks with you, but in a good way. Pale straw in color, slightly oily in the texture and with almost no thickness of body, this malt really lets you focus on the peat. Earthy, smoky, a tinge of sea flavors (seaweed, brine, iodine from the seaweed that grows profusely along the island’s coastline), and did I mention smoky? I personally only buy the 10 year-old expression, because I feel that aging any further dampens the purity of the peat flavors. Also, at approximately $35, it’s probably the best deal in Single-Malt Scotch anywhere. I keep a bottle on hand at all times. With Laphroaig’s Friends of Laphroaig program, the purchase of a bottle grants you the “lease” on one square foot of the distillery’s own peat bog. Yes, you can even show up at the distillery in person and they’ll give you a map to your “plot” and a dram of their whisky “against the chill sea breeze.” You can also register each bottle you buy and redeem points for merchandise in their online store. Nose: A pile of burning hay and grass. Campfire. Scorched wood. Seaweed or sea air. Hickory smoked meat. Black pepper. Palate: Thin body, ethereal. The peat is foremost, with notes of ash, freshly-dug earth, hardwood coals, and smoked fish. As it develops, sweeter flavors emerge. Rosewater, saltwater taffy, buttery croissants, malty beer, oatmeal. Finish: Lingering, with hearty smoke and yet more peat. Also some oiliness on the tongue. The smoke will last all evening – I’ve even woken in the morning with my mouth tasting like a cigar. A dash of water rounds the flavors out – you get more cereal sweetness up front, and the aromatic qualities are more noticable. This dram is somewhat improved by the addition of a minute amount of water. I am well satisfied,and am now on my Tenth bottle. I keep a bottle just for my brother and I and very few friends.No I’m not mean but friends appreciate good malt. i personaly dont get it although the modern chilfiltered 40% is meant to be tamed the web says. im just getting a lake or something very damp. most clean. sweet. and the smoke is like bbq Hickory smoke. not getting tobacco and its not roaring phenolic blast your head off like a 3d series. never tried the other one. im sure it’s very good. @J WHITE, I unfortunately haven’t tried the older versions of Laphroaig 10. I believe these days if you want a true phenol blast, you pretty much have to look at Ardbeg or some of the limited-edition Bruichladdichs (like The Octomore). 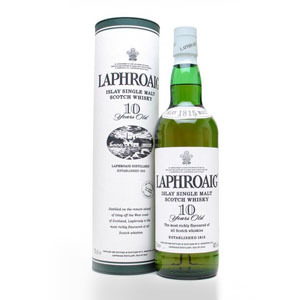 I think Laphroaig 10 is still pretty drinkable when I’m in a peathead mood, and the price is just right. When I want something more elegant and masterful, I look to Lagavulin 16, Talisker 10, or something like Ardbeg Corryvreckan. I think I like it, and I definitely am a sucker for the FOL club. An extra mile that builds a fanbase. Not upset at my purchase, but will research a less intense bottle to add next time. Tullamore Dew and Black Bush will taste like schnapps in comparison. The Laphroaig 10 is indeed my daily dram, and I always have a bottle on hand…however the Laphroaig 10 cask strength is the greatest scotch whisky I have ever tasted. As a craft-presented Laphroaig (no color added, and barrier filtered to remove the wood), it is in your face, and still affordable at only $65, as opposed to the $80-90 for the Lagavulin 16. Also, it must be mentioned that the Lagavulin 16 is watered down at 43%…Should at least be 46% for the money. Man, I love your reviews! Great job. Thanks for the comment! I have a sample of Laphroaig CS that I’m planning to review in the near future. Have you had their Quarter-Cask? It’s only $10-$15 more than the 10 year, here in California, and I think it adds some nice body and excellent wood integration, which is somewhat missing from the standard 10. Sort of like an Ardbeg Alligator for everyday. I have indeed had the quarter cask. While in most places I find it talked and written about in high regard, I do not find it that great. I find the sweetness found in the quarter cask…well, not for me. I’m not a sweetness lover (in my whisky). Drams that I love are the drier, smokier, oakier, peaty, and earthy whiskies. Talisker 10 is another of my daily drams, but the price can be a tad too high. That is why the cask Laphroaig 10 is so good. A mere $15 dollars above Talisker, and so much more ethereal. You are so right though, for the money (which is a phrase I hate by the way)…there is no better whisky than the standard Laphroaig 10…By the way, here in Ohio I am able to purchase the 43% version. It’s far superior to the 40%. Again, I love your site. Keep up the great reviews! I’m sorry to tell you that 10yo Cask Strength has e150a in it I’m afraid. FOL says ‘coloring has no effect to the taste’. Well all due respect I strongly desagree! It would be a lot better without caramel. @spep, thanks for the comment. Caramel coloring is a bit controversy among the whisky-drinking public. The consensus is that whisky at large would be better without it, and I agree. However, I do not think it alters the taste. 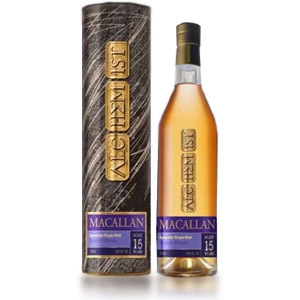 See http://www.masterofmalt.com/blog/post/Can-you-taste-Caramel-%28E150a%29-in-Whisky.aspx for more. I love Laphroaig, they are my favorite distillery. As soon as I can afford it I never will be without a bottle. I also agree with Matt, the Original Cask Strength (Well, just Cask Strength now) is my favorite in their line, and my favorite whisky. I was lucky enough to grab a bottle of the first batch after they started small-batching it. I keep the now-empty bottle on my desk. I think this review is horrible!, Smoke, Smoke Smoke? I find the smokiness as an afterthought and found the sweet sea air and malty sea flavor and sweet peat are what makes this a good scotch. Smoky ??? sure but if that’s mostly what you get than give up scotch and go back to wine tasting. I’ve approved this comment despite your horrible attitude, because I don’t believe in censorship on the Internet. That said, I can’t imagine how you can expect to have a fulfilling or constructive conversation with someone with that kind of approach. While i do not always agree with thescotchnoob and his reviews at times i may get heated but that is on bourbon reviews i have found his scotch reviews to be educational and well worded. Back to what you where saying jeff smoke, peat, maritime air, iodine thats what people look for in an islay malt, you should remember that certain people have a better developed palate than others. You can’t be a bigger “Scotch Noob” than me, and in some respects I agree with Jeff (minus the part about the original review being horrible). I come from big bold bourbons, and when I tried Laphroaig 10 as my second single malt in only two days (the first being Macallan 12), I immediately tasted the sweet and the oak in this (not entirely unlike a bourbon), but then the smoke kicked in. I did find the smoke very powerful and wasn’t sure I enjoyed this Scotch at first because of the finish. I even tasted the smoke the next morning. However, trying this again the second night, I thoroughly enjoyed it and the smokiness somehow diminished it’s presence. Very, very good stuff. Bottled at 43 ABV, by the way here in Burbank, CA. I feel like the smoke’s influence on the taster really is a matter of palate, and by that I mean that each person has a different one. That being said, I have to side with the ScotchNoob; on the nose, Laphroaig attacks with a front line infantry of smokey soldiers of burnt vegetation. My very first dram of Laphroaig 10 brought me to pause for quite some time simply in my attempt to see past that powerful fighting force. However, half of the beauty of these Islay malts is just that: the fight. After the nose, do you roll over and let it beat you or do you persevere through the first wave and see that, truly, there’s beauty past the foray? Tasting this spirit, fields of flavor lie behind Laphroaig’s fire and brimstone; if you can make it through the war it brings, then you can bask in its hidden serenity. I feel that the ScotchNoob has made some valid points here and, while I don’t discredit your observations on this particular whisky, I can’t encourage the delivery of your response. I feel that whisky is meant to bring us together in discussion rather that reduce us to a gang of trolls. Contrary to Jeff I think your review was spot on. I drink the scotch I don’t think a great deal about it. There are days when I want the Laphroaig and days when I want some McCallen. The phenolic taste brings memories of the electrical work that I do, but it is the earthy taste that drifts through my mouth that reminds me of the woods and huntin and campfires of the past. McCarthy’s is very good – the peat profile is a little different than Laphroaig (less salty/seaweedy), but it’s every bit as good. In a blind taste I would swear it was from Islay. Bought my first bottle of Laphroaig 10 this past week. It took me a couple of drinks to become accustomed to the flavours and aroma. Defiantly a bottle I will keep on hand at all times and a hit with friends. Thanks to is site for putting me on to some amazing options. The friend that was to be the best man at my wedding some forty years ago introduced me to Laphroaig. He has sadly passed but I still have the wife and the Scotch, many bottles later. This is my favorite whisky by far. I always have a bottle around. Definitely try the Quarter Cask or full Cask strength – they’re even better! Can anyone comment on the Laphroaig Triple Wood in comparison to this? How far/similar from the Laphroaig 10 is it? The Triple Wood is another one of those difficult marriages between sherry and peat. Murray, I know from his book, thinks these marriages never work. Probably a matter of taste. The Triple Wood is sweeter and less imposing than the 10 with a higher ABV. To me, the 10 as well as the Cask Strength knock my socks off. Whenever I have some, I always think, “why would I ever drink anything else?” The Triple Wood has hints of the Laphroaig 10 but doesn’t elicit that reaction. Bottom line: if you’re a Laphroaig fan and want to try a variation on what Laphroaig does — or if you want to try one of these attempts at a sherried/peated Scotch, by all means try the Triple Wood. But don’t expect the brute force of the 10. Scotchnoob in your honest opinion which would you buy first? Lagavulin 16 year old or Laphroiag 10, after finlaggan i am torn. Garret, if you’re looking for a progression in terms of “smoothness” and refinement (and price), then yes I would recommend going Laphroaig 10 and then Lagavulin 16. The Lagavulin is quite a bit more expensive, so I tend to think of the Laphroaig as a good cabinet “regular” and the Lagavulin as more “special occasion”. They both have unique things to offer, though. I tried Scotch 40 yrs ago and hated it UNTIL I went on a cruise last may and met a Scotsman. He showed me Glennfiddich 12 y/o and I am hooked. I want to buy a bottle of something else to sip and enjoy. 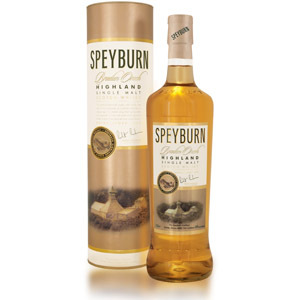 I was thinking of the Laphroaig 10 y/o but it might be a bit too smokey….any recommendations at around $50-60 a bottle. BTW. Laphroaig 10 costs about $57 in NJ. thank you. Obviously I am not new to the drinking world…but ‘new’ to the single malt world. GREAT site btw…. Frank, Laphroaig 10 is very peaty/smokey, yes. It’s something I recommend people try in a bar for the first time, rather than investing in a whole bottle. Peat can be an acquired taste, and many people despise it immediately. For a next step after Glenfiddich 12, I would suggest The Balvenie DoubleWood 12. 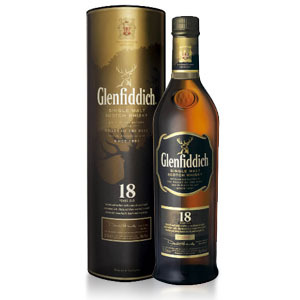 It’s a nice compromise between single malt aged in ex-bourbon (like Glenfiddich 12) and ex-sherry (like Macallan 12). Check out my post here for other ideas: Picking Your First Single-Malt Scotch. Cheers! Just tried this at a local bar last night and was really impressed. With a splash of water this was quite smooth and really a pleasure to sip I will be stopping by the liquor store this afternoon to pick up a bottle. I like Glenlivet 12, but at roughly the same price, I prefer the Laphroaig 10. I foresee this becoming a regular in my cabinet. Laphroaig, a smokey beast to be sure. I cannot decide if i prefer ardbeg or laphroaig each one has elements i like. Scotchnoob what do you recommend next for my islay adventure, I love ardbeg 10 and laphroaig 10 so building off of that what do you think is good. Mr. Hand, I would suggest trying Lagavulin 16 next. It’s pricier, but it’s more elegant and refined than the brasher Ardbeg and Laphroaig. It’s also partially sherried, and is excellently balanced. Another option is to go lighter, with something like Bowmore or Caol Ila, both of which have less peat (or less “apparent” peat character) than Ardbeg or Laphroaig. I bought this bottle upon a recommendation from a Scottish woman at my local store. She said “it was her fathers favorite scotch”. Seeing as how she was undeniably from the mother land I believed her and bought this bottle, but have yet to open it. I don’t love the peat taste so I am wondering if maybe I should return this bottle before I have a $60 (seems like the price has drastically increased since this review) bottle I don’t like. Is the smoke completely overwhelming or is it something that is balanced out by the other flavors? Thanks for your help. Hi, can you give me an advice before i buy a bottle of laphroaig 10 yeas old. I am still confuse because i read review that laphroaig 10 has medicinal notes, i dont mind about it smokiness or peatiness but i am unsure about the medicinal notes. How strong that notes? Is that taste like raw alcohol or vodka? Fyi i hate vodka. When talking about whisky, the term “medicinal notes” refers specifically to an iodine smell/taste, and sometimes refers to the rubber/plastic smell distinct to Band-Aids. These are both caused by phenols (chemical components derived from the use of peat) in the distillate. I would say that they are mild, and just make up a portion of the overall complex aroma that is “peaty”. The iodine, in particular, makes me think more of seaweed (and thus the ocean) than medicine. I personally don’t usually detect the Band-Aid smell, but some people do. Raw alcohol (or “vodka”) notes are much more common in young (under 5 years, approximately) single malts and in cheap blended scotch (which contains young grain whisky). Neither are the case here. Cheers! I haven’t tried this one before and believe I’m a blended girl but it interested me when you mentioned smoked salmon .. I love anything smoked so should I go ahead and try a bottle? Yes, if you already have a taste for smoked foods, you might enjoy the taste of peat in whisky, and Laphroaig 10 is a stellar example. Alternatively, you might be able to find a peated malt (Laphroaig, Lagavulin, Ardbeg, Talisker, Caol Ila, etc.) at a well-stocked bar, which could potentially save you the cost of a bottle if it turns out not to agree with you. Make sure to try it without ice. (Or at least try it both ways.) Cheers! I enjoy this one for how interesting it is. The first dram, I didn’t think I was going to like it. I poured it and let it sit so I could just get accustomed to the smell. It is a mouthful of flavor. To me it is like eating something smoky. I need a glass of water because drinking the whisky makes me thirsty. I didn’t like that at first but it’s worth it now. Laphroaig is worth having in the cabinet for sure. Can’t say it is my favorite, but I’m sure I will keep buying it. Recently picked up my first bottle of Laphroaig 10. At first wasn’t sure I liked it (my first peated whisky was Lagavulin 16), but I’m already starting to like this whisky. It’s definitely not as smooth as the Lagavulin 16, but is one I’m starting to enjoy. LaPhroaig 10 lovers. As of Nov.1, 2014 in Oregon there is a stellar sale for $20.25 on 750ml bottle reduced from $50. That is one “SMOKING” deal on a fantastic scotch and at that price, you can take care of lots of Christmas presents. That is indeed an awesome price! i love this, second bottle ahead. ive been though a few, speyburn, johnnie walker(pure garbage),glenmorangie’ discovery pack was nice. and even the super filthy j&b. but laphrioag has been great thanks for having a site, gives us “noobs” a starting point. i spelled it good too, must be working…lol. Hi Jon, thanks for reading, and for the kind words! I agree on the Glenmo pack – they do a nice mid-level single malt, and I enjoy all three for different reasons. The Nectar D’Or (for a little more money) is even nicer. Cheers! I have only just started to explore single malts and to say I am an amateur is a gross understatement. Unashamedly, and on a scale of 1 – 10, I’m definitely a 1. I really found the review helpful and educational too in terms of helpfully broadening my knowledge. Contributor’s comments I also found helpful as well. I’ve just purchased this brand after a “brain meltdown” from a choice standpoint. I don’t know but somehow I was drawn to this particular brand. It seems that my recent holiday to Scotland (now holiday there twice per year) has opened new doors and.I’m sure my forthcoming journey and exploration of single malts will be an interesting one. I love the Laphroig 10. I like to eat a good aged cheese between sips for an awesome array of tastes. Hours after drinking this stuff if I drink a glass of water I can still taste the smoke. I keep the article about How to pick your first single malt at all time on my phone when I go to the liquor store. Thanks to this I made a few happy picks (very happy with HP12). My first sip or a peated scotch was a Ardberg 10 during a trip in NYC and I found it way too overwhelming, not sure I liked it. I then had a Lagavulin 16 at a friend’s and loved every sip of it. Last week, I was in DC for work and I tried a Laphroag 10, being a bit concerned it would be too much like the Ardberg, in my humble opinion it was not, it is very smoky but I found it more delicate, more layered, the finish was better and the after taste it left really pleasant. I now need to try something like a Bowmore or a Talisker to decide what to buy for my own cabinet. BTW, I cannot find a glendronach here in Colorado, I’ve been searching for the last 3 months. Picked up my first bottle today and just finished a glass. I am highly impressed. I totally get the cigar/ash taste. Far more smooth than I anticipated. Love it! I don’t know where you live where you find these Scotches at the prices you mention, but every single Price I’ve seen you mention on your site is almost always $15-$20 or more where I live (central NJ). I read your reviews. Get excited about a Scotch. See $35 and exclaim “excellent! !” Only to visit 15 different liquor stores in my area and see prices more like $50 or more. I just don’t understand where you get your prices from??? Who here has found Laphraoig 10 for $35?!?!? Prices on whisky are notoriously variable. The East Coast tends to have higher prices (by 10 – 30% on a lot of things) than the West Coast, for reasons related to the post-Prohibition liquor distribution laws in the US (aka middle-men). States (or some provinces in Canada) with state liquor control boards tend to have higher prices as well. Also, posts that I wrote years ago have not been updated (who has that kind of time?) so Laphroaig 10 has crawled from $33 to $40 here but that’s not reflected in my article, unfortunately. For what it’s worth, I’ve noticed that Laphroaig in particular is priced significantly higher on the East Coast. I don’t know why, but it’s probably due to the distributor for that region. I’m in Northern NJ and just found this today in my local liquor store for just under $40. Couldn’t pass it up. Enjoying a glass as I type. I’ve just started my scotch/whisky/bourbon journey and have found this site and the reviews extremely valuable. Having recently graduated up into whisky from craft beer and being a huge fan of rauchbiers I knew this was what I wanted my first single malt purchase to be, especially after the ScotchNoob mentioned it was also his first. First night I was overwhelmed by the smoke! Tonight I’m really finding those maritime notes and enjoying it much more. Forgive my noobness but wow I’m just amazed at the uniqueness of this drink. A great first experience with scotch! Cheers! I’ve been on a 3 month search for scotch. I can’t abide sweetness in my alcohol anymore and I love strong flavors, so scotch seemed the best choice (can’t drink martinis all the time). 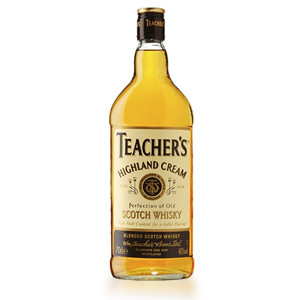 I’ve settled on Teachers as my everyday – with ice and an occasional splash of San Pellegrino, it’s a nice cocktail. The hint of peat in Teachers had me hooked, so I tried the Laphroaig based on your review. It plugged every receptor in my brain. The smoke doesn’t hit my palate as hard as many describe, but that Oceanic blast! It’s near ruined me for anything else. I admit that I often just uncork the bottle to get a sniff. Love your insights, so many thanks for the guidance. My first introduction to peaty whiskey was a shot of Ardbeg 10 years in some bar a couple years ago. I was immediately captivated by the smokey leathery flavor, and that was when I started really enjoying whiskey. I’m currently studying abroad and decided to get a bottle of whiskey and went to the local liquor store. Unfortunately, there were no Ardbeg, so I bought this just because it said “the most richly flavoured of all Scotch whiskies” for quite a price(liquor is pricey around here). I was very pleased with the bottle, and the first thing I felt was the taste of herbal medicine, although now I think about it that was probably the “Iodine/Seaweed” you mentioned. Now I’m experimenting with adding water to whiskey, but it seems hard to find the perfect ratio. Do you have any tips for this? Thanks for the great review! Water is a personal type of thing, but I generally only add a few drops of water to help open up aromas (like 3 to 6 drops with a dropper, or the smallest splash you can possibly make via pouring, if you’re careful. A straw also works). Some people use water to proof down a whisky to nearer cocktail strength (like 30% ABV), but I personally find that can dampen the more subtle flavors. Many times I don’t add any water at all. Cheers! I’ve recently gotten into scotch over past 5 months. Around November last year out of the blue I decided to start drinking it. Always been a beer drinker most of my life. Started out with some sample size Glenlivet and Balvenie and was hooked. I picked up bottles of Glenmorangie 10, Bunnahabhain 12 & Dalwhinnie 15. Just trying different kinds to see what I liked. Laphroaig 10 was on my list to try but I didn’t want to buy an entire bottle due to the love it or hate it reputation. No bar in the area offers it either. Last week I was in New Orleans for a few days and got the chance to try it. First whiff of the glass I knew I was in for something I hadn’t experienced yet. Smoke, sea air, salt and more smoke. I wasn’t sure what to make of it. I sipped on it through our meal of gumbo, red beans & rice. Later that night while dozing off to sleep I was still thinking about that scotch. The next evening I was at another restaurant and got a glass of it once more. Again the nose of it was right in your face. As I sipped on it waiting for our meal I really picked up on the complexities of it along with what I experienced the night before. I officially became a fan. When I got back home this week I picked up a bottle of the Laphroaig 10 and now when I enjoy a dram it reminds me of New Orleans. I forgot to mention I love this site. Full of great information. Thanks for all the hard work to make it happen. I find the finish as I drink more to be unpalatable. The first sip I can savor, but the more I drink, the less I want more. For context, I think every second of Ardbeg 10 is divine. Is it possible to get a bad bottle, or is it just not the scotch for me? Also, my bottle is 43% abv while your review lists it at 40%.